Note from Sara: You may remember that I've been lucky enough to have John (aka "El Gaucho") guest post for me in the past. He and his girl, Alycia, have been friends of mine for years and years, and they're also the most prolific gardeners I know. Because it seems that Mellisa and I are new to the world of growing our own food, I thought I'd ask John to hop over and offer up some tips. I'll be pestering him for more as the season continues on, and hopefully we'll bully him into sharing more of his wisdom come next spring when it's time to plant again. Enjoy! This is the second part of a series of gardening posts. Find a Resource for Help. Just about every city or town in the United States has a local Master Gardeners program, extension service or gardening club(s), that would be more than happy to answer any questions you might have about gardening in your area. Utilize the magic of the Internet to help you find these resources, or ask at your local nursery/garden store and they can help guide you in the right direction. The best resource for gardening tips are other gardeners themselves. Ask family, friends, and co-workers if they garden, or if they have a friend or neighbor who gardens, and who might teach you. Peruse around your neighborhood and see who has a nice vegetable garden (yes this might be hard to see without peeping into someone’s back yard) and strike up a conversation them. Offer them a few hours of free labor from you in exchange for them teaching you what they know. Most gardeners are quite happy to offer their knowledge and experience and would be happy to chat with a newbie. I’m lucky in that my In-Laws have a beautiful garden and live only an hour and a half away. They’re more than willing to discuss their experiences of what does and doesn’t grow in the area, what pests to watch out for, when to be wary of frost, etc. We also have huge veggie exchanges throughout the year and each grow and then swap what works well in our respective gardens. They grow a ton of rainbow chard and beets but don’t even eat them (they just like they way they look), so we get a bumper crop of these every year without ever having to grow any ourselves. If you have kids, try to get them involved in the gardening as well. Not only (when properly harnessed) are they a great source of free labor, but they’ll benefit from a closer connection to their food source and interaction with nature. New studies have come out and authors (see Richard Louv in particular) have examined the link between kids exposure to nature and gardening and reduced behavioral problems and physical ailments. And anything that gets a child to eat more fruits and veggies is going to help them lead healthier lives. Try growing vegetables that will captivate kids' interest. Depending on their age, growing carrots can be a magical thing, the moment that they pull a full formed carrot from the ground that they planted a few months ago can be enthralling. Veggies like cucumbers, melons, zucchini, or pumpkins are entertaining for kids as they are large bushes with big pretty blossoms and produce hefty fruits. Growing snap peas, cherry tomatoes, or strawberries can make every stroll through the garden a healthy snacking opportunity for you and your children. 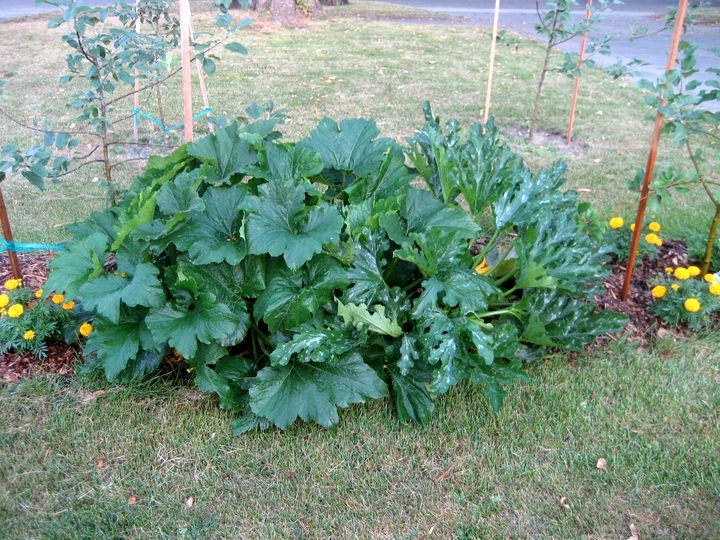 What kid wouldn’t be impressed with a zucchini plant like this one that produces dozens of zucchini every week? Embrace Perseverance and Seek Inspiration. Every gardener fails. Every gardener has failed at something in their garden, killed a plant, and allowed weeds to run rampant. I’ve killed plants, lost harvests, or seen plants die from just about everything you can imagine: bunnies, birds, hail, squirrels, acts of God, a careless step in the wrong direction, simple neglect, various diseases, over watering, under watering, rampaging garden gnomes (OK I made this one up), over exuberant dogs (this one is true), bad soil, wind storms, too little sun, too much sun, pulling a garden hose the wrong way, and the list goes on and on. The bottom line is to not let your setbacks get the best of you and never let the things that failed define your experience in the garden. And seek inspiration every chance you get. Go on garden tours, visit local farmers markets to find new fresh fruits and veggies, and find cool sites on the Internet. Here are the websites of two of my most inspirational gardeners, though they’re not necessarily oriented towards fruits and veggies, they are amazing. Not only are they great writers, but they post regularly and are spectacular photographers. Each post has dozens of beautiful pictures that make me want to get off my tush and play outside in the garden. Nothing tastes quite as good as veggies you grow yourself. It may be entirely in your head, or simply a result of the time and effort you put into growing it, but nothing matches the satisfaction, pride, and freshest of fresh taste you get with homegrown fruits and veggies. If you haven't before (or even if you've tried and not quite succeeded) I would highly recommend trying your hand at some gardening and raising some of your very own grub. I love this series!! It makes me feel as if gardening doesn't have to be as daunting as I've imagined.